Words With Friends: Another Stupid Game -- or an Obsession? By the year 2015, experts predict that 80% of the world's population will have a smartphone, a tablet, or a laptop computer; if you live in the developed world, you likely already have at least 2 of these transportable devices (along with 65% of the people around you). That means that you are connected all day, every day, no matter where you go, unable to escape from the "plugged-in" aspect of today's culture. Renowned "psychology of technology" expert Dr. Larry Rosen argues that this constant flow of information is more than the human mind was meant to handle. He shows, for example, that there is little difference between BlackBerry addicts and those suffering from obsessive­ compulsive disorder. Our technology use has sprouted a whole new array of symptoms of common disorders, from teenagers uploading their every move to Facebook to the 40-year-old who scours the Internet for information on the differences between freckles and melanoma, despite reassurances from his dermatologist. More importantly, Dr. Rosen shows that there is a way to achieve harmony with technology without being controlled by the constant influx of information. 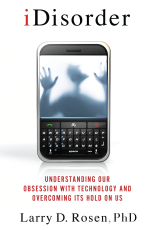 In this timely work, Dr. Rosen and his colleagues Dr. Nancy Cheever and Dr. Mark Carrier sort through the latest research from the fields of neuroscience, sociology, and psychology to show how our dependence on technology has gone past convenience and into a dehumanizing obsession that permeates society. In a world where technology continues to advance faster than we can keep up, Rosen's work helps us see the warning signs of iDisorders, and develop strategies to maintain our humanity.